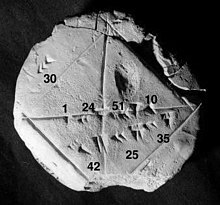 A black and white rendition of the Yale Babylonian Collection's Tablet YBC 7289 (c. 1800–1600 BCE), showing a Babylonian approximation to the square root of 2 (1 24 51 10 w: sexagesimal) in the context of Pythagoras' Theorem for an isosceles triangle. The tablet also gives an example where one side of the square is 30, and the resulting diagonal is 42 25 35 or 42.4263888. Computational mathematics may refer to two different aspect of the relation between computing and mathematics. Computational applied mathematics consists roughly of using mathematics for allowing and improving computer computation in applied mathematics. Computational mathematics may also refer to the use of computers for mathematics itself. This includes the use of computers for mathematical computations (computer algebra), the study of what can (and cannot) be computerized in mathematics (effective methods), which computations may be done with present technology (complexity theory), and which proofs can be done on computers (proof assistants). Both aspects of computational mathematics involves mathematical research in mathematics as well as in areas of science where computing plays a central and essential role—that, is almost all sciences—, and emphasize algorithms, numerical methods, and symbolic computations. mathematical economics, the use of mathematics in economics, finance and, to certain extents, of accounting. ^ National Science Foundation, Division of Mathematical Science, Program description PD 06-888 Computational Mathematics, 2006. Retrieved April 2007. ^ "NSF Seeks Proposals on Stochastic Systems". SIAM News. August 19, 2005. Retrieved February 2, 2015. ^ Future Directions in Computational Mathematics, Algorithms, and Scientific Software, Report of panel chaired by R. Rheinbold, 1985. Distributed by SIAM. ^ Mathematics of Computation, Journal overview. Retrieved April 2007. Cucker, F. (2003). Foundations of Computational Mathematics: Special Volume. Handbook of Numerical Analysis. North-Holland Publishing. ISBN 978-0-444-51247-5. Harris, J. W.; Stocker, H. (1998). Handbook of Mathematics and Computational Science. Springer-Verlag. ISBN 978-0-387-94746-4. Hartmann, A.K. (2009). Practical Guide to Computer Simulations. World Scientific. ISBN 978-981-283-415-7. Nonweiler, T. R. (1986). Computational Mathematics: An Introduction to Numerical Approximation. John Wiley and Sons. ISBN 978-0-470-20260-9. Gentle, J. E. (2007). Foundations of Computational Science. Springer-Verlag. ISBN 978-0-387-00450-1. White, R. E. (2003). Computational Mathematics: Models, Methods, and Analysis with MATLAB. Chapman and Hall. ISBN 978-1584883647. Yang, X. S. (2008). Introduction to Computational Mathematics. World Scientific. ISBN 978-9812818171. Strang, G. (2007). Computational Science and Engineering. Wiley. ISBN 978-0961408817.